Must see this video !100MB! I joined the Texas Air National Guard and went AWOL. I refused to take a drug test or answer any questions about my drug use. By joining the Texas Air National Guard, I was able to avoid combat duty in Vietnam. COLLEGE I graduated from Yale University with a low C average. I was a cheerleader. I ran for U.S. Congress and lost. I began my career in the oil business in Midland, Texas, in 1975. I bought an oil company, but couldn't find any oil in Texas. The company went bankrupt shortly after I sold all my stock and got my money out. I bought the Texas Rangers baseball team in a sweetheart deal that took land using taxpayer money. With the help of my father and our friends in the oil industry, including Enron CEO Ken Lay, I was elected Governor of Texas. I am the first President in U.S. history to enter office with a criminal record. I invaded and occupied two countries at a continuing cost of over one billion dollars per week. I spent the U.S. surplus and effectively bankrupted the U.S. Treasury. I shattered the record for the largest annual deficit in U.S. history. I set an economic record for most private bankruptcies filed in any 12-month period. I set the all-time record for most foreclosures in a 12-month period. I set the all-time record for the biggest drop in the history of the U.S. stock market. In my first year in office, over 2 million Americans lost their jobs and that trend continues every month. I'm proud that the members of my cabinet are the richest of any administration in U.S. history. My "poorest millionaire," Condoleeza Rice, had a Chevron oil tanker named after her. Plus she is damn good in bed . My wife was so upset about Condi calling me her husband; she spent two nights at the Mayflower. I set the record for most campaign fund-raising trips by a U.S. President. I am the all-time U.S. and world record-holder for receiving the most corporate campaign donations. My largest lifetime campaign contributor, and one of my best friends, Kenneth Lay, presided over the largest corporate bankruptcy fraud in U.S. History, Enron. My political party used Enron private jets and corporate attorneys to assure my success with the U.S. Supreme Court during my election decision. I have protected my friends at Enron and Halliburton against investigation or prosecution. More time and money was spent investigating the Monica Lewinsky affair than has been spent investigating one of the biggest corporate rip-offs in history. I presided over the biggest energy crisis in U.S. history and refused to intervene when corruption involving the oil industry was revealed. I presided over the highest gasoline prices in U.S. history. I changed the U.S.policy to allow convicted criminals to be awarded government contracts. I appointed more convicted criminals to administration than any President in U.S. history. I created the Department of Homeland Security, the largest bureaucracy in the history of the United States government. I've broken more international treaties than any President in U.S. history. I am the first President in U.S. history to have the United Nations remove the U.S. from the Human Rights Commission. I withdrew the U.S.from the World Court of Law. I refused to allow inspectors access to U.S. "prisoners of war" detainees and thereby have refused to abide by the Geneva Convention. I am the first President in history to refuse United Nations election inspectors (during the 2002 U.S. election). I set the record for fewest numbers of press conferences of any President since the advent of television. I set the all-time record for most days on vacation in any one-year period. After taking off the entire month of August, I presided over the worst security failure in U.S. history. I garnered the most sympathy for the U.S. after the World Trade Center attacks and less than a year later made the U.S. the most hated country in the world, the largest failure of diplomacy in world history. I have set the all-time record for most people worldwide to simultaneously protest me in public venues (15 million people), shattering the record for protests against any person in the history of mankind. I am the first President in U.S. history to order an unprovoked, pre-emptive attack and the military occupation of a sovereign nation. I did so against the will of the United Nations, the majority of U.S. citizens, and the world community. I have cut health care benefits for war veterans and support a cut in duty benefits for active duty troops and their families-in-wartime. In my State of the Union Address, I lied about our reasons for attacking Iraq and then blamed the lies on our British friends. I am the first President in history to have a majority of Europeans (71%) view my presidency as the biggest threat to world peace and security. I am supporting development of a nuclear "Tactical Bunker Buster," a jumbo WMD. I have failed to fulfill my pledge to bring Osama Bin Laden to justice. I have wiretapped millions of American phoneconversations while ignoring the legal requirement for a court order todo so. I have signed over 750 Signing Statements (indicating I have nointention of following the laws I signed into effect) which is more than allPresidents in U.S. history combined. And, after receivinig the recommendationsof the 9/11 Commission (which I opposed from the start) I was given a"failing grade" from that Commission on implementing their anti-terrorprograms, with the Commission stating that if there was a grade lower than"failing" I would have gotten that instead. Bush is against campaign finance reform; then he's for it. Bush is against a Homeland Security Department; then he's for it. 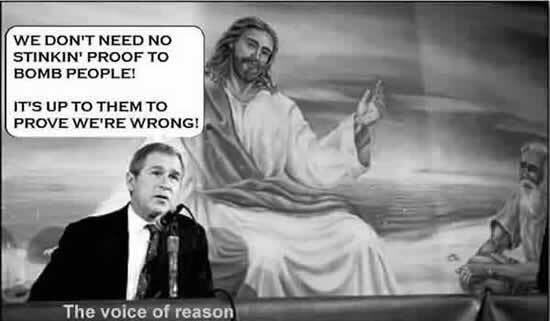 Bush is against a 9/11 commission; then he's for it. 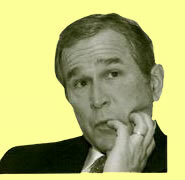 Bush is against an Iraq WMD investigation; then he's for it. Bush is against nation building; then he's for it. Bush is for free trade; then he's for tariffs on steel; then he's against them again. Bush is against the U.S. taking a role in the Israeli Palestinian conflict; then he pushes for a "road map" and a Palestinian State. I ran for Congress and lost. I produced a Hollywood slasher B movie. I bought an oil company, but couldn't find any oil in Texas; company went bankrupt shortly after I sold all my stock. I bought the Texas Rangers baseball team in a sweetheart deal that took land using taxpayer money. With my father's help (and his name) was elected Governor. the most polluted state in the Union. I replaced Los Angeles with Houston as the most smog-ridden city in America. I cut taxes and bankrupted the Texas government to the tune of billions in borrowed money. I set the record for most executions by any Governor in American history. appointments to the Supreme Court. all-time record for biggest drop in the history of the stock market. the first president in US history to enter office with a criminal record. This is going to make the History even if some people don't like it.